1. These maple bacon Pop Tarts. Maple bacon is all the rage right now. 2. "Murasaki Imotion": purple sweet potato ice cream with purple sweet potato chunks. BOUT TIME Oreos jumped on the red velvet train. 4. This array of complex regional flavors. 5. These bacon, buttered popcorn, or pizza Dum Dums. Lingering pizza flavor in my mouth? No thanks...Plus, if there isn't any cheese that stretches before me, than I'm not into it. 6. These salted caramel Pringles. Served by the enticing Ms. Green M&M. 8. Oatmeal raisin Girl Scout Cookies with Greek yogurt chunks. 10. Roulette Doritos where one chip was significantly spicier than the rest. But apparently this chip caused a student to stop breathing. Eat with caution. 11. Apple pie Kit Kats. 12. Raspberry ice cream with marshmallow and raspberry swirls and dark and white fudge ice cream cones. So does this represent our disappearing atmosphere? 13. These cheesecake Kit Kats that are also BAKEABLE. Whhaaaaaa?? Bring. these. to. the. U.S.! 14. These café mocha M&M's. Imagine melting these in a cup of hot chocolate. 15. Toffee Girl Scout Cookies. I would devour an entire box of these in 10 seconds. 100% would try. 100% likely to vomit. And if you want to make them, go here! 18. Salted caramel brownie ale. Yesyesyesyes. I live for boozy ice cream. 19. 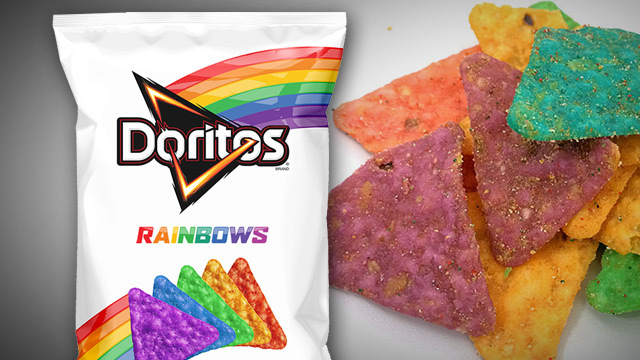 And the most epic of them all, RAINBOW Doritos!!!! One of the few, but proud moments of 2015.